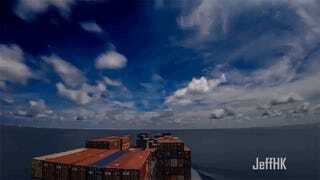 Climbing aboard a container ship isn’t exactly the most glamorous way to travel, but when the footage is condensed into a time lapse—oh my, is it stunning. It’s especially neat to see the different layers of the sky dance overhead, but the coolest part is just being around all that blue. It really makes you feel the vastness of the world.